Location: Castleblayney, County Monaghan, Ireland. Condition: The building still stands, although unoccupied. Ownership / Access: County Council. 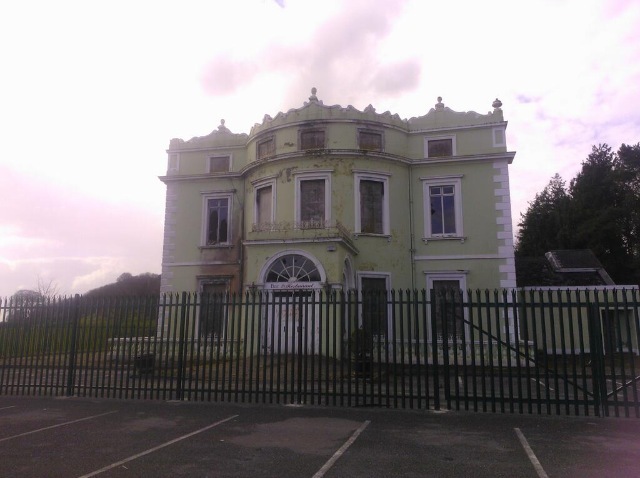 Notes: Hope Castle, also referred to as Blayney Castle, is an 18th-century house built in the town of Castleblayney, located in County Monaghan, Ireland. Over the years, Hope Castle has been inhabited for various uses, such as homes to many, military barracks, a hospital, convent, and was most recently used as a hotel before its demise in 2010. The building still stands, although unoccupied. In November 2010, the eighteenth century home was subject to an arson attack that left the hotel building with extensive interior damages. In a very short amount of time the fire spread through the bar and lounge areas, up the stairwells, and into the upstairs rooms. The building was uninhabited at the time of the fire; however, the contents of the hotel including a considerable amount of the fittings, furniture, and valuable antiques were left completely destroyed. At the time of the incident, it was clear to local Gardai that entry was gained by trespassers to the ground floor of the building where the fire was started. It is believed that a local group of teenagers forced entry to the building and intentionally started the fire. Although Gardai questioned juveniles in the town, no persons were ever found guilty of the crime.Lieutenant General The 11th Baron Blayney originally built the current Blayney Castle (also known as Castle Blayney and later renamed Hope Castle) in the 1780s. It was later redesigned and styled using Georgian architecture by Irish architect Robert Woodgate in the year 1799. It is a three-story, five bay house located near the site of an earlier plantation, which was restored during the Victorian Era. Some of the embellishments include cresting on the roof parapets and on the entrance to the building, which has a central curved bow. A glass projection porch and canopy of ornamental iron cast were also added to the structure. The gate lodges, stables, and bath houses are still present, which provide a strong sense of history to the land. When it was taken over by the local County Council, the building was renovated and the 19th century additions to the gardens and main front were demolished. Hope Castle is surrounded by grounds of green land next to a forest area accompanied by a large lake, known as the Black Island. The building, although not currently in use, consists of several bedrooms, a bar lounge and restaurant area.